Zephyrhills 100th Anniversary: Neukom’s Drug Store - Zephyrhills, Florida 100th Anniversary! 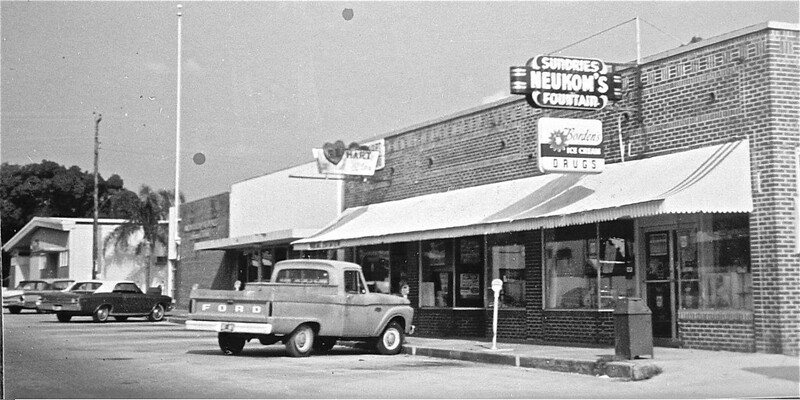 Early in Zephyrhills history, a tradition was born: Neukom’s Drug Store and its unique culture! George Neukom said in a May 15, 2000 St. Petersburg Times interview that his grandmother started the drugstore in 1921. Lorena Mae Leatherman Neukom, affectionately called “Neukie,” opened the store with her husband, Charles. She made several business moves from one corner of the block to another and in 1935 built the brick building that became the permanent location until it closed in 2001. Neukie was an active member of the staff until age 93 — doing payroll, buying merchandise and keeping the books. She personally picked out all of the merchandise items. Jon Ferguson, a ZHS grad of 1951, gave us more details. When the St. Petersburg Times reported on the closing of Neukom’s Drug Store in 2001, a regular at the time, Gordon Winters, then 88 and a 30-year veteran of the morning coffee ritual said that Neukom’s and the Scratch game were a part of Zephyrhills history…a lot of memories there. The Scratch Game brought local politicians, businessmen and other movers and shakers for decades to the corner Neukom’s health food store. The Scratch Game ritual began in 1938, when George Neukom’s grandfather, Charles, invited a couple of his pals for Coca-Cola at the drugstore soda fountain. The local dentist, Dr. B.A. Thomas, became a regular, along with the filling station owner and the city clerk. Each man chose a number between one and 20. Then one final card printed with those numbers was passed around. Each man scratched out a number other than his own. The person whose number remained unscratched at the end of the game paid for everyone’s coffee. Son, George Neukom II, said that his first remembrance of his wife, Ann (Smith) Neukom was at the store when she came to sell an advertisement for the ZHS annual called the Zephilsco. “Whatever you needed, Neukom’s had it. I loved to hear the elder Mrs. (Neukie) Neukom talk,” said Benny Smith. Wish I could go back to that time. As for the scratch game…It is alive and well at Barb’s in Zephyrhills. Incidently, George Neukom is a participant nearly every morning. Neukom’s drug store is one of the fondest memories of growing up in Zephyrhills. We went every Sunday night after church to have lime freezes – they were the best. Neukie and Jerry had the same birthday. One year she told him he could have anything in the store and he got a coloring book!